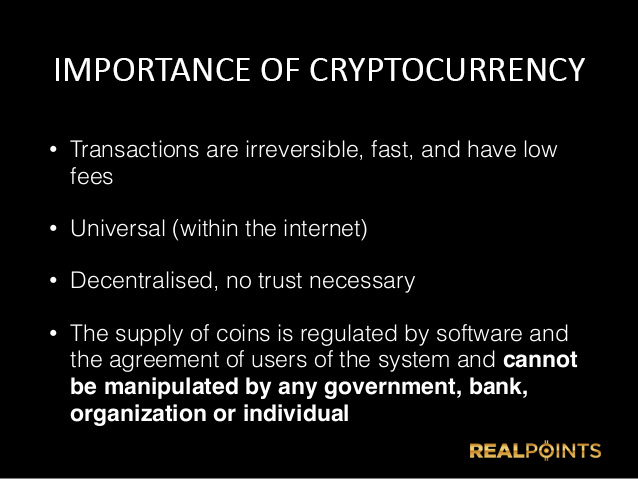 Real Points Cryptocurrency: What is Cryptocurrency? We can say that it is a digital currency which is decentralized which means it’s not controlled by any bank and government. So why should we use currency like this? Well first of all you can send money to anyone anywhere in the world, instantly and with no middle hand or huge fees like banks make you to pay. Anyone can use it, if you have internet connection you have the access to this currency and its financial system not like modern day banking system where only few have access to it. No FRAUDS! Something very important I think for everyone is that because this currencies are digital they cannot be counterfeited or reversed by the send as with credit cards charge backs. There is limited supply. Means that all the currencies have their own limit of how many coins they can produce. In this way the chance of inflation which occurs often with fiat money is eliminated. There is more than 700 official cryptocurrencies out there. And all of them want to have the fame of Bitcoin. But you know what they say “The more the better”. 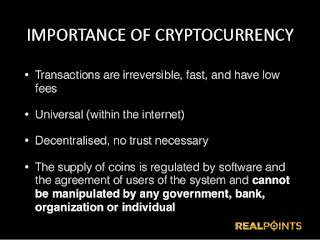 All of us that we are using cryptocurrencies in our daily lives I think we are all more than happy to see every day more and more people showing interest in this currencies but still.. its only a small percentage.. people are still afraid, they learned to live their life’s in one way using paper money and credit cards enjoying the security that their banks are providing them but for how long? Every day we see countries’ economies falling down and crashing. Countries like Spain, Portugal, Cyprus and many more to come. So here I am and ask, why people are refusing to adopt a new way of life? New era of money, new era of payment systems. Imagine going to work and getting paid in Bitcoins in 2011 or 2012? When Bitcoin price was even less than 100$, imagine what investment is that salary today when Bitcoin price is more than 1500$. Or lets take it more simple, you go today and buy 10 Bitcoins with price of 1500$ which means you will pay which means you need to pay 15,000$, in 1 year Bitcoin price rises to 2500$ (which will happen because this is still the beginning of cryptocurrencies) that will mean that your 10 Bitcoins today are worth 25,000$ means in 1 year time you had profit of 10,000$ on your 15,000$ investment, now show me bank or financial institution which can do this to you and I will go today to deposit all of my money. To summarize all this, and to don’t waste your time more, have in mind that we have just started. The world will be taken over by cryptocurrencies sooner or later so join us today and don’t waste time waiting the tomorrow to come.